Located in the heart of Palm Springs, California with a spectacular mountain setting at the base of the beautiful San Jacinto Mountains, Marquis Villas Resort provides gorgeous views alongside elegantly furnished, spacious accommodations with luxurious tubs and cozy fireplaces alongside fully equipped kitchens and private patios or balconies. Explore the wonders of Palm Springs (only a short walk away)- the eponymous “Hollywood’s Hideaway” which provided a serene getaway for stars in the past and a chance to experience all the glam and glory of Golden Era Hollywood (as well as some celebrity sightings) today. Skip along the famous Palm Springs Walk of Stars for a glance at names like Marilyn Monroe and Elvis Presley, check out the extraordinary dining and shopping options just blocks away, head out to Wet N’ Wild Waterpark for a day of family-fun, or stop by for the star-studded, red carpet International Film Festival in January to check out the biggest names in the entertainment industry worldwide! Golf destinations abound and outdoors enthusiasts will be delighted with the comprehensive menu of activities ranging from desert hikes to mountain climbing to aerial trams to fishing and more. And on days where you just want to stay in and relax, the resort offers a variety of onsite attractions including multiple outdoor swimming pools, hot tubs, massage services, sports courts, and a state-of-the-art fitness center. Whatever your age, whatever your idea of fun, Marquis Villas Resort- with its wonderful location, spacious rooms, and friendly staff- is dedicated to making your dream vacation a reality. Tucked into the eclectic and exciting town of Palm Springs, Southern California, Marquis Villas Resort offers the best in natural landscapes and outdoors activities, charming Hollywood-esque town-life, and exciting attractions such as waterparks for the kids, casinos and nightlife for the adults, and wildlife preserves and zoos for the wonder and amazement of every age. Try the aerial tram to Mt. San Jacinto for stunning summit views or hike and bike through the surrounding desert landscapes, resplendent with invigorating sunshine, whimsical wildlife, and vaulted sapphire skies. Head over to the Magic Jungle Wildlife Preserve to see tigers, leopards, and cougars up close. Not feeling that adventurous? Enjoy a relaxing day of golf on one of the nearby courses or walk around Downtown Palm Springs for delicious wining and dining, exciting park attractions, wonderful shopping, a night out on the bar scene, or a little bit of star-struck sightseeing. One thing is certain when you visit the Palm Springs area- you’ll never run out of things to do and see! This Pool View One-Bedroom, Two-Bathroom accommodation is a sprawling 1000 sq. ft. featuring fantastic views of the San Jacinto Mountains and can house up to 4 guests. The master suite features either a plush king or a cozy pair of Double beds, according to your preference, as well as an en suite bathroom with a luxurious Garden Tub and walk-in shower. Enjoy a homemade meal courtesy of the full kitchen- equipped with fridge, microwave, oven, stove, toaster, coffee maker, blender, dishwasher, cookware and silverware along with a wet bar- around the elegantly-set dining table. After dinner, feel free to relax in your spacious living area, featuring sumptuous sofa seating and a cozy fireplace, for a late-night movie on your private TV. A queen sleeper sofa and additional bathroom make having extra guests an easy feat, and the room WiFi and Internet Access complete this picture of comfort and convenience. Before heading into bed, take a moment to step out onto your private balcony and indulge in a spot of stargazing over the gorgeous mountain foothills. Please note that images on this listing are representative of the style and quality of units on property. Actual unit is assigned upon arrival. Layout of unit, views and furniture may vary slightly. Marquis Villas Resort offers endless opportunities for fun right on-site. 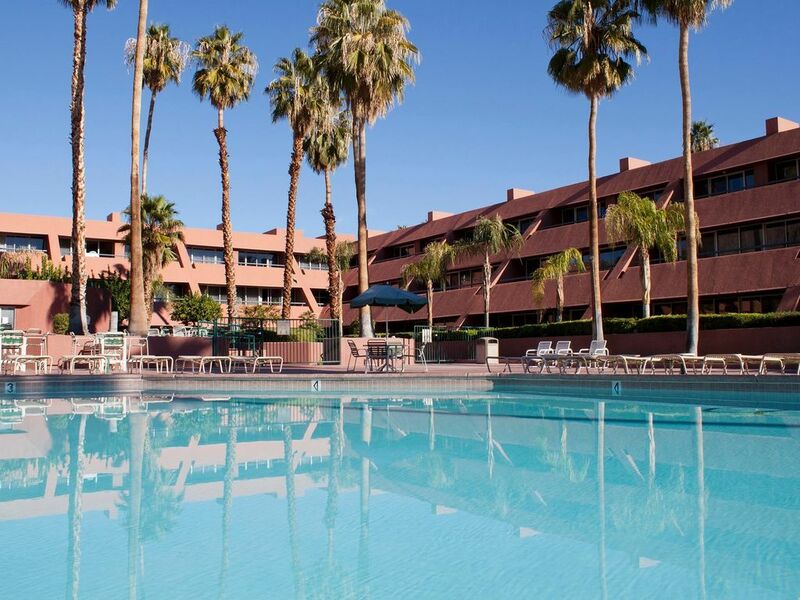 Relax poolside while the kids splash around in the Children’s Pool and enjoy the wonderful views of the San Jacinto foothills. After a long day of mountain hiking or city exploring, take a rejuvenating dip in the hot tub or schedule a muscle-melting massage. Basketball and tennis courts are just outside your door and equipment rentals are complimentary, so games with the family are both fun and free. The BBQ Area is a family-favorite, and the Fitness Center will help you burn off any excess helpings after an afternoon grilling session. So take a walk on the lovely grounds, challenge your friends to a game of pool, float around the crystalline pools before heading out for days filled with shopping and sightseeing, and know that you have a beautiful home away from home to come back to at the end of each glorious day. The rooms on this hotel should not be up for rent (at least the room we got). Not only that everything is VERY old, but minimum that a hotel room should have is not meet. The bathroom is falling apart; paint is peeling, cabinets are in the worst shape, the shower is rusty. In the bedroom the bed skort is wrinkled beyond explanation, the mattress pad is stained, the carpet pure descusting - I will not walk bear feet. Drapes are stained and wrinkled. I did not expected a 5 star hotel, but any hotel should meet standars to be open for rent. A hotel bed should give you the confidence you can put your head down to sleep not worried that your skin is going to touch a stained mattress pad. I advice to do your research on this property before booking. Thank you for addressing your concerns regarding your most recent visit to Palm Springs. We deeply apologize for your experience & wish we would've been notified of your concerns while at the resort, we will have someone reach out to you as soon as possible. Great location. Short walk to Palm Canyon Drive. Great pool. Room was clean and neat. Common areas needs an update. Hall carpet seen better days. Faucets in bathroom need attention and toilets flush poorly. Front desk and facilities personnel were great. Looking forward to coming again. The booking transaction was smooth and easy. There were no surprise fees. __________________________ OTHER THINGS TO KNOW __________________________ - ­­­Check in Time: 4:00 pm - Check Out Time: 10:00 am - All Guest Suites are Non-Smoking - Minimum age requirement for check-in is 21 years of age. - All reservations that have an alternate guest checking in should make prior arrangements with the resort. - Pets are not permitted and strictly enforced with the exception of Service Animals. - This property charges a mandatory resort fee due at check-in. Please check listing below for details. Rates subject to change. Please call the resort if you have any special needs. Please note that every attempt will be made to accommodate requests for suite location and early arrivals; however, these requests are based on availability and occupancy. Unfortunately, the resort is unable to guarantee room location. AT CHECK-IN: A photo identification, credit card for $100 security deposit and a nightly rate of $15.95 pre taxed resort fee will be required at check-in. (cash is not an acceptable form of deposit). Resort Fee includes WiFi, covered parking (subject to availability), tennis and basketball courts, pool with hot tub, business center computer/internet and boarding pass printing. This property charges a mandatory resort fee due at check-in. Please check listings for details. Rates subject to change. Click "Book it Now" for rates and availability. Reservations may be cancelled up to 8 days prior to arrival. A cancellation fee of 25% of the reservation will be charged. Cancellation requests made 7 days or less prior to arrival are non-refundable.